CALBAYOG CITY, Samar – The infusion of ICT (Information Communication Technology) in schools becomes part of the core of education, alongside reading, writing and numeracy. Samar’s First District Representative Mel Senen Sarmiento said that the government is pushing for the creation of a Department on Information & Communication Technology, and the proposal has included the DepEd (Department of Education) for the maintenance of facilities under their control, commissioning state colleges and universities for repairs and other technical supervision. Be it noted that the computer laboratory at Gadgaran Elementary School campus has effectively served the pupils and the whole community. In collaboration with Christ the King College Computer Studies in effecting one of the extension programs of the Franciscan Catholic institution, it conducted basic orientation trainings to barangay officials on how to operate the facilities. Its positive impact had been acknowledged by the local government. In fact, other schools were interested to replicate the program by requesting Congressman Sarmiento to provide computers to both elementary and high schools. The solon disclosed that in partnership with the Northwest Samar State University and the DepEd Calbayog, he already prepared his counterpart and tied-up with the Ayala Group for the installation of a satellite disc. In Calbayog City, 29 schools were identified by Sarmiento and each of them will receive an average of 10 computer sets. The following school-applicants are Bagacay, Binaliw, Bugtong, Cagmanipis Norte, Cagnipa, SPED Center, Pilot, Capoocan, Carayman, Carmen, Dagum, Danao 1, Macatingog, Mag-ubay, Malaga, Malajog, Matobato, Migara, Nijaga, Obrero, Oquendo, Pena 1, Rawis, San Joaquin, San Policarpo, Tabawan, Tarabucan, Tinambacan and Trinidad. He was hopeful that the program be realized next year. Aside from the ICT, “Sakay Na” Program of LGU-Calbayog is soon to be implemented in other towns of Samar said Sarmiento. Aware of the laudable impression it brought not only to poor families with students attending classes in distant areas, former president Gloria M. Arroyo in her visit to this city has also recognized the noble intention of said program which was only implemented here during Sarmiento’s term as mayor. CALBAYOG CITY, Samar – In pursuit to strengthen the public-private partnership, a Memorandum of Agreement (MOA) between the city government and the SOS (Save Our Souls) Village Calbayog was realized on October 16, 2010 as part of the 62nd charter day celebration. The ceremonial signing was held at the Helmut Kutin Social Hall of Herman Gmiener Laboratory School Campus now the LGU Calbayog - SOS Family Training Center. In behalf of the city were Mayor Reynaldo S. Uy and Vice-Mayor Ronaldo P. Aquino, while Village Director Emily Torculas represented the SOS Calbayog. Based on the agreement, the LGU-Calbayog as a local government unit shall encourage and support the development of appropriate and self-reliant scientific and technological capabilities and enhance economic prosperity among its residents. SOS, in pursuit of one of its purposes and objectives enable families to be self-sufficient and ventured in establishing the family strengthening program (FSP) and helping them secure through the collective efforts to be productive and provide them livelihood and thereby increase their income capabilities. In the partnership agreement, the city and the SOS shall jointly create the management committee that will oversee the implementation and identify viable programs and projects that they mutually supported, monitored periodically its implementation, assess accomplishments in terms of impact to the recipients and to the community, exchange technical expertise and recommend appropriate measures relative to the success and progress of the programs and projects about to be implemented. The city will financially and technically support the programs and projects covered by the joint venture such as to provide equipment; maintenance of the building and structures presently utilized, payment of electric, water and other utility concerned; provide 24-hrs security in the vicinity of the existing demo farm and all the buildings utilized by the Tri-District. Structures of the former school campus have been converted into Tri-District Office, Palayamanan Peace House, Community Seed Composting Facility and a Training center for families and out-of-school youths. Other areas were used as demo farm. The SOS on the other hand shall assist in the organization and identification of community workers as well as to contribute expenses; and to initiate study for the creation or establishment of other programs and projects that may be covered by the joint cooperation. Mayor Reynaldo Uy in his speech said that the city under the present dispensation has endeavored to revive the Tri-district program which has an analogous purpose with that of SOS. As provided in Section 3 paragraph 1 of the Local Government Code, the participation of the private sector in the local governance particularly in the delivery of basic social services shall be encouraged to ensure the viability of local autonomy as an alternative strategy for sustainable development; and the local government units may enter into joint ventures and such other cooperative arrangements designed to improve productivity and income among others pursuant to Section 35 of Republic Act 7160. “This is an ongoing project of SOS and partnership started during the previous administration of Mayor now Congressman Mel Sarmiento, igpapadayon ngan papabaskugon ta la… a perfect public-private partnership which is based on PNoy’s SONA (State of the Nation Address)”, said Mayor Uy. Since the city has a good financial status, it has a borrowing capacity to support the programs and projects of the Tri-District, he added. SOS Village Director Emily Torculas on the other hand was very grateful when Uy donated P240,000 worth of check for the SOS. To pursue the family best care and family strengthening programs, she appealed before the crowd to extend assistance and generosity for there had been a plan that SOS Village Philippines be independent in terms of “funds”. In another development, shredders and compost brewers were turned over on the same day to the City Agriculture’s Office and CUPS (Calbayog Urbanization Program and Services); OK Progress (Oquendo Key Progress for Economic Revitalization of Economic Sustainability and Services) and the Seeds and Growers Assn. Calbayog, respectively. CAMP LUKBAN, Catbalogan, Samar – As its annual dedication in the name of freedom and democracy, the Philippine Army’s 8th Infantry Division once again joined the people of Eastern Visayas in the 66th commemoration of the Leyte Gulf Landings yesterday, October 20 at McArthur Park, Palo, Leyte bearing the theme: “Passing on the torch of heroism to the Youth of today”. As early as 4:00 a.m., the troops were already positioned in the “unknown heroes” monument for the “Sunrise Ceremony” where retired Colonel Francisco San Miguel, the vice-president of the Veterans of the Philippines, other dignitaries and veterans lay wreath to salute the unknown soldiers of Leyte who fought for the country during the Japanese occupation in the country. They were then repositioned on the grounds of McArthur Park to carry out historic task for the activity. Around 10,000 spectators from all walks of life including some foreign personalities witnessed the activity. 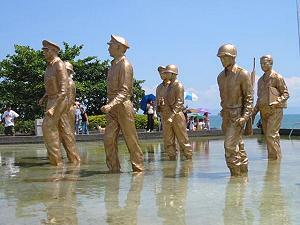 Living WWII veterans and their relatives who became the center of the activity add light with the annual commemoration. Meanwhile, the troops steadfastly endured the strong heat of the sun as they wait for the highlight of the program. Around 9 o’clock in the morning, when the program started with the arrival of Under Secretary Samuel Bagasin of the Department of National Defense as the commemoration speaker. No less than the commander of 8ID, Major General Mario Chan hosted the arrival of USec Bagasin with a full military honor. The activity has renewed the spirit of nationalism for everyone when the Philippine flag was raised and the Philippine National anthem is being played that spearheaded the raising of flags and playing of the other nation’s national anthem such as the Australia, Japan, Canada, New Zealand and United States. These countries played important role when WWII erupted in the country. The wreath laying ceremony to the Heroes memorial, participated by the representatives of the aforesaid countries took place immediately after the national anthems had been played. In the messages given by the foreign representatives, they commonly focused their talks on the positive effect that the coming back of McArthur had brought not only to the Philippines but also to the other nations. It cannot be denied by the fact that then two (2) opposing countries before such as Japan and USA are now frequently seen in union advocating peace-related endeavors. This endeavor further inspires the people of Eastern Visayas to sooner achieve and re-experience the freedom and democracy that were given to us by our forefathers but vehemently deprived by the local terrorist group. With the huge numbers of people who witnessed the program, it also showed that people still lingers for a peaceful life not for a violent and barbaric cause as enforced by the New People’s Army (NPA) in the province. The program was concluded by a grand parade headed by the 8ID contingents who tendered salute to the veterans of the country. A “Sunset Ceremony” was also tendered at the “Unknown Heroes” memorial statue to wrap up this year’s celebration of the Leyte Gulf Landing anniversary with the 8ID troop’s 21-gun salute and sounding of “TAPS” for our unknown heroes. TACLOBAN CITY – Leyte Governor Carlos Jericho Petilla and Dr. Andreas Lange of the German Technical Cooperation Agency (GTZ) signed on October 19, an agreement that will further boost the collection of taxes in the province of Leyte. The document signed by Governor Petilla and Dr. Lange is an addendum to the Memorandum of Agreement (MOA) signed on March 2, 2009. The document is geared to improve and strengthen the good fiscal management of the Local Government Units (LGUs) of the province of Leyte through the fiscal decentralization and local financial management component of the GTZ Decentralization Program. The GTZ Decentralization Program through the Integrated Taxation System (iTAX) is focused on improving tax assessment and collection system and increasing the revenues of LGUs more particularly real property tax, business tax, and other local fees including non-taxable revenues. GTZ has extended the continued use of iTAX and do a Joint Transfer Project with the province of Leyte to make tax collection more efficient and effective and to further benefit the province. GTZ will provide iTAX software free of charge for use in the province of Leyte and its municipalities; assist and supervise the province of Leyte in the implementation of iTAX project; provide user’s manual of the modules implemented in the province of Leyte; provide access to the web forum and avail access to download updates for the iTAX software, assist the province through hotline support; conduct trainings of the province and municipal IT personnel and end-users; assist in implementing iTAX In the province and its municipalities with an iTAX technical expert; provide recommendation and guidance in other computerization programs available in the province and assist in linking iTAX system especially its GIS components with ongoing GTZ assistance inland use and development planning. On the other hand, the province of Leyte shall procure and maintain the necessary hardware for the use of the iTAX program; shall provide the required IT personnel and corresponding office space and training venues; provide sufficient office space for the iTAX project personnel of GTZ; shall organize the initial encoding of the FAAS and RPTAR; conduct at least a quarterly meeting between the provincial chief executive, the project manager, city/municipal mayors of participating LGUs in the province of to monitor the progress of the iTAX project; serve as secretariat of the provincial iTAX steering committee and the iTAX technical working group through regular meetings and an actual iTAX implementation to fast track delivery of the system and activities as planned; ensure that there are at least two iTAX users in each participating LGU in the province holding a permanent position for the sustainability of the iTAX project in the province and to ensure that municipalities are enabled to use iTAX and GIS outputs in their ongoing efforts in land use and development planning. CALBAYOG CITY, Samar – In celebration of Calbayog’s 62nd cityhood held on October 16, 2010 Mayor Reynaldo Uy acknowledged former Senate President Jose Dira Avelino’s legacy when he created it into a city. Addressing before the crowd at the city hall stage, he mentioned the accomplishments made by his administration during his 9 years of service as a local chief executive before he proceeded to the House of Representatives. During the period, a slogan of “Bag-o nga Calbayognon” was imprinted in all identification cards issued by the city encouraging participation and collaboration of all local government employees and elective officials in order to achieve progress for the city. 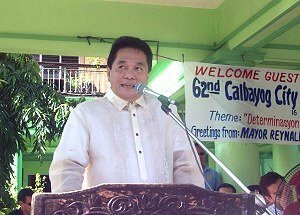 Celebrating its 62nd cityhood and serving the people for 24 years, Uy said that anyone could tell how Calbayog has grown. “Yana nga ika-62 anyos san Calbayog, nakita naton an pag-uswag tikang sa 1992 hasta yana nga akon pagdumara. Sa pagkaurusa dida gud man ngay-an makakab-ot an kaupayan san aton ciudad”, he declared. He believed that the team USA which stands for Uy, Sarmiento and Aquino could do more with the help of the Sanggunian through the people’s “straight LP voting strategy”, where no opposition was given a seat in the legislative since 2007 up to the present. 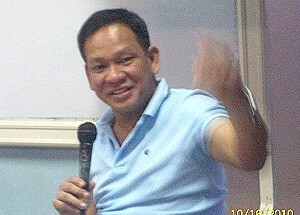 Aside from the “straight LP voting strategy”, he also encouraged his employees including elective officials to regularly attend the flag raising and retreat ceremony as a manifestation of respect to the national flag, which in a way a good example of effecting better services to the people in order to achieve laudable performances in their respective area of work while in the process of implementing the different Tri-District programs and projects of his administration. Part of the celebration was the unveiling of Aguit-itan Development Project, with a structure of a medium rise 2-story building which would cater 500 families identified by the Urban Housing Department as informal settlers living in said area. Since Calbayog and the first district of Samar have been regular recipients of EVRMC (Eastern Visayas Regional Medical Center), the local government realized that a hospital, owned and managed by the city should be built in order to address health problems in the area. As an aftermath of a series of consultation between the executive and the legislative, the groundbreaking ceremony took place on the same day. Local officials headed by Mayor Reynaldo Uy and the Sanggunian signified their signatures in the testament – a commitment of the city government and the first congressional district of Samar, to provide accessible health care service to the constituents as one of the flagship projects of the Tri-District Development Program of the city. CATBALOGAN, Samar – Some thirty sectoral representatives attended the Tripartism, Occupational Safety and Health Productivity forum today at the Graduate School of the Samar State University. Sectors from the transportation, bakery, labor, power, academe, fuel and the government came to heed the call of the Department of Labor and Employment (DOLE). They also elected the officers of the Samar Provincial Tripartite Industrial Peace Council. DOLE Regional Director Forter Puguon personally witnessed the organization of the structure that will help DOLE monitor the compliance of Samar establishments on their compliance to occupational safety and health standards. Ms Flordelis Geonzon from DOLE 08, who talked about mechanism to promote industrial peace, said that government-labor and management should move through a consultative/participatory type of leadership to discourage adversarial effects. Establishments, she added should promote a decent work agenda where workers have the freedom, equity, security and human dignity. Meanwhile, Ms Edita Clarin urged the management sector of the participants to provide at least some non-wage benefits that are within the family welfare program. Puguon in his presentation profusely thanked the private sector managers and the others for showing up. He also urged them to look into the welfare of their labourers in the workplace. “We can’t compromise the safety and health of our workers in the workplace,” Puguon stressed. Officers of the Provincial Tripartite Industrial Peace Council are Engr Eduardo Arosa - President, Florencio Cerdeña - Vice President, Ninfa Quirante - Secretary, Audrey Rose Abandia - Treasurer and Vic Cababat - Auditor. 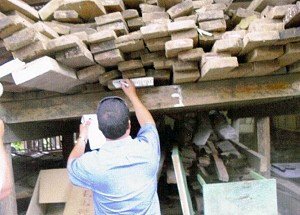 TACLOBAN CITY – Operatives of the Community Environment and Natural Resources Office in Catbalogan, Samar with the assistance of law enforcement partners, raided a compound of a certain Demetrio L. David of Barangay Trinidad, Calbayog City on October 8, 2010. An estimated value of P251,223 worth of undocumented lumber of lawaan, yakal and banuyo species, unregistered circular saws with blades, one hand saw, and one motorcycle as hauling equipment were apprehended and confiscated during the raid. By virtue of Search Warrant No. CN-25 issued by Executive Judge Cresente F. Maraya of RTC Branch 11 in Calubian, Leyte, operatives from the Department of Environment and Natural Resources’ (DENR) Regional and CENR Office in Catbalogan Samar headed by CENR Officer Elpidio Simon, National Bureau of Investigation, Philippine National Police, some members of the media and the local officials of Barangay Trinidad, successfully executed the raid that yielded the contraband items. Appropriate criminal charge is now being readied against the possessor of the undocumented lumber and accessories, Demetrio L. David for violation of Section 77 of P.D. 705 as amended by E.O. 277 and other pertinent laws. The confiscated forest products and accessories are now in custody of the CENR Office in Catbalogan, Samar. DENR Regional Executive Director Primitivo C. Galinato, Jr. expressed thanks to the Department of Justice through Executive Judge Crescente F. Maraya, Jr., the operatives from the PNP, NBI and media for their support during the raid. This helped the DENR in its all out war against forest law violators. “We will not stop there! We capitalize on the support extended to us by our partners even in future operations that may be conducted against illegal loggers in other parts of the region,” RED Galinato said. We are extending so much effort in rehabilitating our forests through plantations and foot patrols and we will not allow illegal loggers to destroy our forests which are supposed to benefit us and the succeeding generations sustainably through legal processes,” RED Galinato stressed. The all out war against illegal loggers is consistent with the DENR’s management direction, “From the Ridges to the Reefs”. This considers ample protection on the forest being an important ecosystem in the upland areas. Any unsustainable practices in the forests would certainly affect the sustainability of the other ecosystems from the uplands to the lowlands which include the mangroves, coastal and marine ecosystems where most of our basic needs come from. TACLOBAN CITY – CapitaLand Hope Foundation, CapitaLand’s philanthropic arm, has donated S$125,000 or about P4.15 million, to provide nutritious food for malnourished children in the Philippines. This project will benefit over 2,408 children suffering from malnutrition, from five schools in the Visayas region, particularly in Samar Island and Southern Leyte in Eastern Visayas, and Camotes Island of Central Visayas, who will be provided with supplementary feeding as well as Vitamin A and de-worming tablets, Totch dela Cruz of Plan Philippines informed the Philippine Information Agency. Plan International will also use the funds to provide medical, dental checks and treatments, if necessary, and develop health education courses for the children. Besides providing these children with nutritious food and healthcare, this project will help to raise children’s and parents’ awareness of proper nutrition and hygiene practices. In addition, the schools will use the contribution to develop and maintain school-based vegetable farms to ensure long-term food security for the children. Of the 2.58 million children between the ages of six and ten, in the Philippines, over 25% are considered underweight. This project is based in the Visayas areas of the Philippines and is supporting five schools where over a quarter of the school children are malnourished. This means they are frequently subjected to bullying from their peers, suffer from malnutrition-related health problems, go to school hungry and often end up dropping out of school. This project will directly benefit 2,408 children and indirectly benefit 1,857 more children, as nutrition within the community improves. “We hope that together with the strong support from Plan International, we will be able to bring about positive, sustainable changes to these children’s lives. Providing nutritious food for these children is in line with CapitaLand Hope Foundation’s focus on supporting program for the shelter, education and healthcare needs of underprivileged children,” he added. CapitaLand Hope Foundation (CHF), the philanthropic arm of CapitaLand, was established in 2005 to further CapitaLand’s corporate social responsibility commitment to build a better future for underprivileged children. Its focus is to support programs for the shelter, education and healthcare needs of underprivileged children. Every year, CapitaLand allocates up to 0.5% of its net profit to the Foundation. As one of the first foundations created by a Singapore real estate company, CHF leverages on CapitaLand’s extensive geographical footprint by identifying and supporting program in countries where CapitaLand operates.